This Model is suitable to pack products like cream sandwiched biscuits in standing on edge position. 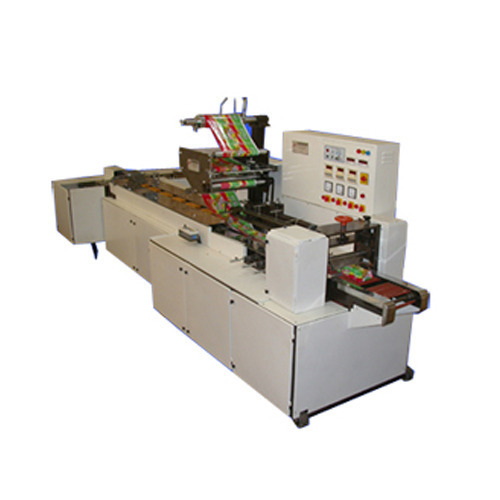 This type of biscuit packing machine can also be used for packing biscuits which are difficult to stack by auto-feeding arrangements. Products are fed manually on 'L' conveyor which are transferred and loaded to main in feed conveyor and arrives to the forming box. The wrapper is wrapped around the forming box. Fin seal at bottom is completed by three pair of rollers out of which one pair is for pre heating, second for heating and third for propelling purpose, which controls the wrapper around the periphery of the product. The crimping jaws makes cross sealing at two ends and separation, such packets are delivered to the out feed conveyor. Direct Heat Sealable BOPP, Laminate of BOPP with Moralized Heat Sealable BOPP/CPP/Pearlised BOPP, Laminate of Polyester with Heat Sealable BOPP/CPP/Poly, Heat Sealable Laminates Containing Aluminum Foil. Product Width MIN 35 M.M. Product Height MIN 35 M.M. Product Length MIN 60 M.M. Wrapper Cut Off Length 75 M.M. Maximum Reel Width 280 M.M. Maximum Reel Diameter 300 M.M. • Automatic self contained unit. • All components coming in contact with product are of stainless steel or Food Grade plastic. • Ease of change over to different varieties of product in minimum time. • A.C. motor with variable frequency Inverter Drive. • Separate Temperature Controllers are provided for each pair of Heating rollers and jaws. • Cut off Length adjustment by just rotating wheel with Display. • Simple to operate and easy to maintain.